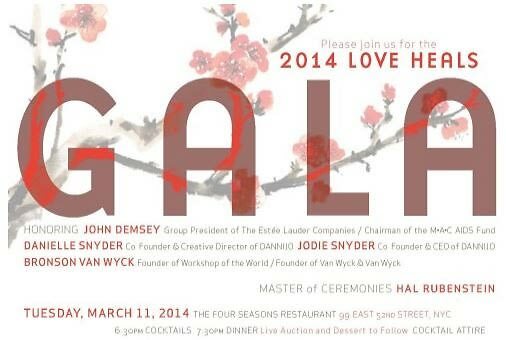 Love Heals, the Alison Gertz Foundation for AIDS Education will host the annual Love Heals Gala, honoring John Demsey, Danielle Snyder, Jodie Snyder and Bronson van Wyck. Guests will take part in a spirited program, cocktails, dinner, and a live auction. All proceeds from the evening directly support Love Heals’ efforts to empower young people in the fight against HIV. When: Tuesday, March 11. Cocktails, 6:30 PM, Dinner, 7:30PM. Founded in 1992 to carry on the work of the late AIDS activist Ali Gertz, Love Heals empowers young people to become leaders by giving them the knowledge, skills and confidence to protect themselves and their communities from HIV. Love Heals’ HIV-positive speakers break down stigma and make the disease real for young people living in communities hardest hit by the epidemic. The leading provider of HIV/AIDS education in New York City public schools, Love Heals has partnered with more than 700 schools and community groups throughout the metropolitan area, educating and empowering more than 625,000 young people, parents, guardians, educators, and community leaders.